At Abrams College, we strive to be the leader in not only graduation rates, but also with job placement rates. While the vast majority of our students obtain employment after graduation, some may need a little extra help in the area of job seeking. 1. Direct referral. When employers contact our school looking for graduates, we log the employer and job information into our data base with the current job offering. 2. Resume builder. 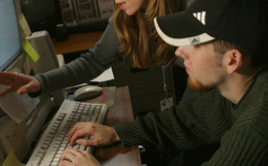 The staff of Abrams College will assist students in using the resume builder computer program. This program will assist the student in generating a professional and comprehensive resume and cover letter. 3. Current and historical job openings. Staff of Abrams College update the current employers’ section on a weekly basis. These jobs provide immediate employment opportunities for Abrams College students. 4. Interview and job-seeking workshops. During the term, Abrams College will offer a workshop for students who are interested in building interviewing skills. Practice interviews will be scheduled and critiqued. At Abrams College, our school cannot be successful unless you are successful. Because of this we will work diligently and tirelessly to assist you in any way possible to obtain your educational and vocational goals.